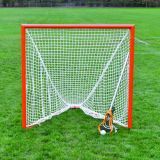 Champion Sports Official Lacrosse Nets offer unparalleled durability. 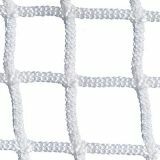 This tournament quality 7 mm net features official size square nylon mesh, and is a great choice for beginner to competition level lacrosse players. 6' x 6' x 7. 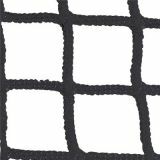 Thickness: 1.5"
3mm, 1-1/2" square mesh knotless polyester net with lacing cord. 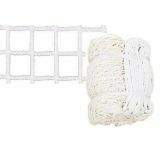 Size 4' H x 4' W x 4' D.
5mm knotless netting, 1-1/2" squares. Official size 6' x 6' x 7'. Meets all NFHS and NCAA regulations. 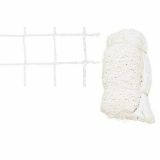 Weatherproof white polyester with natural UV stabilizer. 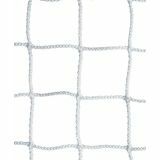 Triple stitched webbing binder. Includes lacing cord. 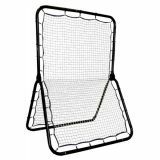 The rebounder is equipped with a sturdy Y-frame that adjusts to several angles. 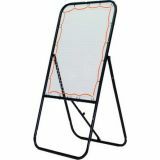 The rebounder's nylon surface area can also be used for such sports as softball or baseball, and is an excellent training device for all skill levels. 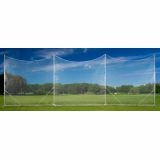 This target features a sturdy steel frame with a 4' x 3' rebound area. 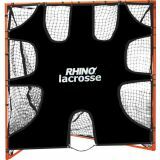 Adjustable for different rebound angles, this target is excellent for drills and skill development! 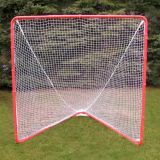 This goal target fits official game size goals, and features 9 target zones that pinpoint goalie weak spots. 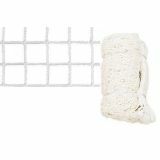 Made of all-weather durable mesh, this target attaches in seconds with quick goal fasteners!